New York's midtown fell into chaos on Friday morning when Jeffrey Johnson shot Steve Ercolino. Police Commissioner Raymond Kelly has announced that the other nine victims were injured in police crossfire. 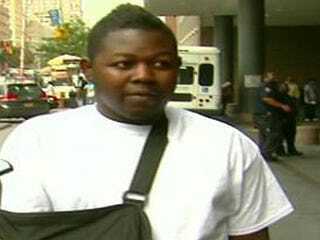 Robert Asika was one of those unlucky people, suffering a bullet in his elbow. The 23-year-old Bronx, N.Y., native, who sold sight-seeing tickets, told Newsday that he was heading for work when he saw people running. "I looked around and I saw two police officers with their guns out," Asika said. "I saw a white guy. He had a briefcase. I guess the cops were speaking to him." Next thing he knew, Asika was struck by a bullet in the left elbow, he said. Asika said he assumes that police shot him "because of the way the guy was standing." Police Commissioner Raymond Kelly said earlier that injuries to bystanders included "graze wounds to the leg and an individual's forearm." Asked how he feels about the possibility that he was hit by a police bullet, Asika replied: "Stuff happens. I don't really feel bad about it."